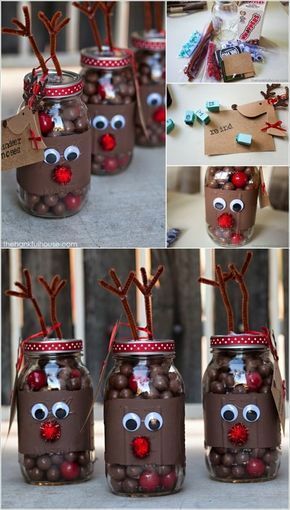 Christmas Mason Jars are a great way to spread holiday cheer. They are cute, easy to make, and best of all AFFORDABLE! From yummy recipes to cheerful decorations, mason jars can really turn the Scruge frown upside down! New Braunfels Feed & Supply offers Mason Jars for you to create into the perfect gift for someone or the best Christmas decoration! Combine flour, baking powder, baking soda, and salt in a small bowl. Pour into the bottom of a 1-quart mason jar (I rolled up a paper plate to use as a funnel). Top the flour mixture with M&M’s, dropping them in lightly, so that they don’t sink into the flour. Top the M&M’s with brown sugar, and then granulated sugar (use a spoon to carefully scoop the sugars into the jar). Seal with the lid and decorate with ribbon and fabric (see note). Pour the contents of the jar into a large bowl and stir to combine. Add 1/2 cup of melted and cooled unsalted butter, 1 beaten egg, and 2 teaspoons vanilla extract. Stir until combined. Chill for 30 minutes. Make golf ball sized portions of dough and place the dough balls onto lined baking sheets. Bake at 350°F for 8-10 minutes, until the centers of the cookies are just barely set. I used a 6.5-inch circle of fabric to decorate each Mason jar. This cookie mix comes just short of reaching the top of a 1-quart Mason jar. I decorate the top of the jar with fabric which covers the inch of open space at the top of the jar. If you would prefer to fill the jar all the way, you can increase the amount of M&M’s to 1 1/4 cup. For a Mason jar gift, you can make in bulk, try these easy candles. Wrap the jar with wide plaid ribbon. Secure with three jute strings tied in a bow. Hot-glue a pinecone and artificial greenery to the bow. For a final touch, wood-burn a snowflake or polka-dots onto four wooden beads and thread onto four of the string ends. Place a tall, slender pillar candle in the jar. After the holidays, there’s still a whole lotta winter left. Help your friends carry on with a “winter survival kit” packaged cutely in a Mason jar. Fill the jar with small items like lotion, tissues, lip balm, and a handful of chocolates. Dress up the jar with ribbon, a die-cut snowflake, and a label, and add a paper circle to the lid. This entry was posted on Friday, November 30th, 2018 at 10:29 pm	and is filed under News & Updates. You can follow any responses to this entry through the RSS 2.0 feed. Both comments and pings are currently closed.